If at first you fail, try and try again. Just make sure to try something that works for you, not for other people. 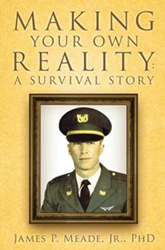 This is the most essential lesson shared by Vietnam Combat Helicopter Pilot veteran Dr. James P. Meade in his new book, "Making Your Own Reality: A Survival Story." Dr. James P. Meade survived a severe traumatic brain injury in Vietnam and awoke from a 10-week coma with no memory of the first 19 years of his life. Robbed of the ability to read, write or communicate, he slowly relearned essential skills. After years of tireless effort, he earned his Ph.D. and now works to help those with brain injuries around the United States. His book helps those with limitations in understanding how to cope. Meade shows readers that spending a lifetime imitating the able-bodied is a dead end street. Failing a task repeatedly shows disability; succeeding in your own way shows intelligence and creativity.